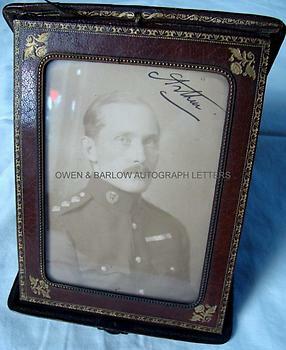 PRINCE ARTHUR OF CONNAUGHT PHOTOGRAPH SIGNED. Prince of the United Kingdom. Grandson of Queen Victoria. Son of Arthur Duke of Connaught and Strathearn and Princess Louise Margaret of Prussia. He was married to Princess Alexandra Duchess of Fife. Arthur was Governor-Genral of South Africa from1920 to 1924. Photograph, signed. 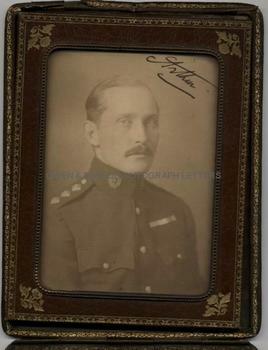 The photograph shows Prince Arthur of Connaught quarter-length in the uniform of a Captain in the Royal Scots Greys. The image measures approx 6 x 4.5 inches. 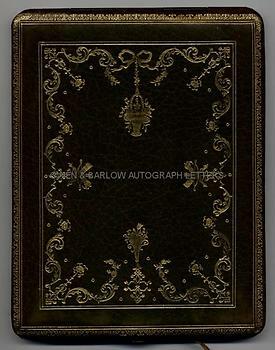 Mounted in its original very handsome folding morocco leather frame which measures approx 7.5 x 5.75 inches when closed. The frame is tooled with gilt fillets, fleurons and swags, with gilt tooled edges and dentelles.The glass is edged with repousse metal beading and the inner frame lined with watered silk. It is hinged and with a metal clasp. Royal photographs in frames of this quality are usually reserved only for family members or very close friends and this was probably a photograph that was formerly in Royal ownership. The inner silk lining is a little weak at the hinge and there is a small split to the leather at one edge. The metal clasp no longer functions. The frame and photograph are otherwise in fine condition. Prince Arthur of Connaught was educated at Sandhurst and saw action in the Boer War as a young officer in the 7th Hussars. During the First World War, as a Captain in the Greys, he served in France as aide-de-camp to successive leaders of the British Expeditionary Force, John French and Douglas Haig.